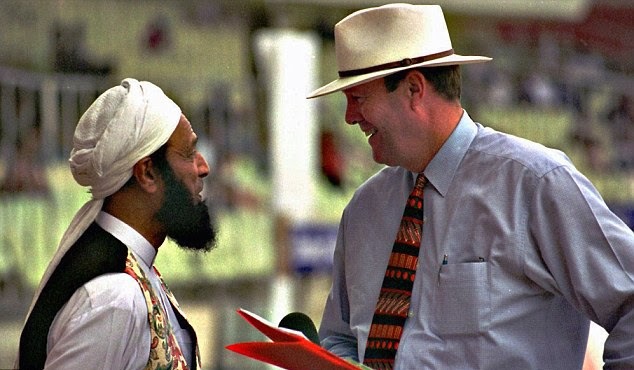 Can you identify this man seen alongside Tony Greig ? !! ? For those who have visited or lived over there – it is like Madurai person knowing Mattuthavani bus stand … for those of us – it is Vadivelu asking ‘wherein Dubai one worked – abi dabi? … or Vivekanandar kurukku thereu! !’… Some get more excited about IPL rather than World T20 WC about to happen in Bangladesh…..
United Arab Emirates simple Emirates or the UAE, is a country located in the southeast end of the Arabian Peninsula on the Persian Gulf, bordering Oman and having boundaries with Saudi Arabia & sharing sea borders with Qatar, Iran and Pakistan. Established on 2 December 1971, the country is a federation of seven emirates; each being governed by a hereditary emir who jointly form the Federal Supreme Council. The constituent emirates are Abu Dhabi, Ajman, Dubai, Fujairah, Ras al-Khaimah, Sharjah, and Umm al-Quwain. Those of us fond of Cricket heard more of Sharjah earlier - Sharjah is one of the emirates covering 2,600 km² comprising the city of Sharjah, and other minor towns and enclaves such as Kalba, Dibba Al-Hisn and Khor Fakkan. The emirate is a constitutional monarchy of the Al Qasimi dynasty. It has been ruled by Sultan bin Mohamed Al-Qasimi since 1972. You are reading all these because IPL will start on April 16 in the UAE and is likely to be held in three phases across three countries, ending in India on June 1. A detailed schedule of dates and venues is yet to be finalised but an IPL announcement said that the first 16 matches would be held in the UAE from April 16 followed by a set of matches between May 1 and 12 to be held in either Bangladesh or, the Indian Home Ministry permitting, in India. The announcement brought to an end a long period of speculation over the final venue. The problem arose because the tournament dates coincide with the Indian elections; IPL is keen on having most matches in India which makes commercial sense but Home Ministry made it clear that it would not be possible to provide the required security for the tournament during the elections. BCCI has approached the federal Ministry of Home Affairs for permission to play IPL matches in India from May 1-12 in cities where the polling has concluded. "If it is not possible to play in India during this period, IPL matches will be held in Bangladesh," the statement said. There will be no matches on May 16, the day set aside for counting of all the votes in the election. UAE has been playing Cricket too and have won ACC trophy on four occasions. They played their 1st ODI in 1994 and played in the 1996 World Cup. They have qualified for 2015 Cricket World Cup through 2014 Cricket World Cup Qualifier and gained ODI status. Remember that Riaz Poonawala who played for Maharashtra, emigrated later and played 2 ODIs for UAE in the Australasia cup. There is the Sheikh Zayed Stadium which hosts matches regularly. So more Sharjah or rather UAE – IPL …………. The man at the start is Saeed Anwar nicknamed ‘desert fox’…. He scored 4052 test runs in 55 tests and 8824 one day runs in 247 matches. He was very successful at Sharjah scoring ton after ton…. .. in 1997 he made 194 runs in an ODI at Chepauk, Chennai, which stood as the highest for sometime till the double centuries eclipsed that .. now we have 3 double tons in Mens Cricket and all the 3 are Indians. Incidentally, Anwar got a pair at his Test debut against the West Indies in 1990.